Jigging technique is a marine and freshwater fishing techniques used to do if you are fishing in an area that has sufficient depth of approximately 30-100 m. jigging technique is a fishing technique that uses a metal bait on jigs that stretched into the water by shaking – goyangkannya vertically so it seems, metal bait jig moving up and down with the active and attract predatory fish to eat. Although this technique is generally done at sea fishing, but some are done in fresh waters such as lakes lake in America and Europe. Although the practice is easy jigging technique that continues to move enough to get tired of the bait anglers who tried it. 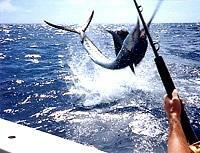 With the location of the middle waters, for fishing target fish jigging technique is to fish predators such as the GT (Giant Trevally), and the Baracuda fish and Marlin.